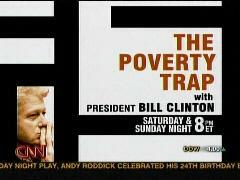 Sitting in the CNN green room in Washington today and staring at the tube during "Live From" at about 2:10, I noticed a promo for a big show this weekend starring President Bill Clinton. On Saturday and Sunday night at 8 PM Eastern, CNN will air a special edition of "CNN Presents" hosted by Dr. Sanjay Gupta. Shortly after yesterday’s announcement of Rep. Tom DeLay’s (R-Tex) indictment for alleged campaign finance violations, the mainstream media began doing reports on the subject with largely similar content. A memo written by Democratic National Committee Chairman Howard Dean posted at the Democratic Party’s website almost immediately after the announcement was made contained virtually the same “hotbuttons” as those subsequently raised in media accounts of the story. Kyra Phillips: "Now, I've seen Michael Bolton sitting behind the President. Obviously not now, we're looking at different live pictures. Are we going to hear from him? Or have we heard from him?" Richard Roth: "Well, you may -- you're not going to hear him sing. I think you said Michael Bolton, John Bolton the US ambassador-"
Phillips (embarrassed): "John Bolton. Richard, thank you so much. You're taking me back now to, what, the early '80s? My goodness." Roth: "Yes, and this ambassador has much shorter hair." Phillips: "And no relation, right? Maybe we should make that clear." Roth: "No relation. Though some of his remarks has -- have caused some hair-raising reaction from advocates for some groups...."
Transcript continues below. Video available in Windows or Real. At 1:41 EDT, CNN's Kyra Phillips interviewed Brooks Jackson, former CNN reporter and current director of the Annenberg Center's Political Fact Check, on his latest issue of Fact Check, which categorizes the anti-John Roberts ad by NARAL Pro-Choice America currently running on CNN during commercial breaks as patently false. Phillips expressed concern over lack of federal laws against false political attacks ads, but failed to ask Jackson whether CNN bore an obligation to cancel the ads altogether. Jackson noted that NARAL's ad, unlike most campaign ads his group has analyzed recently, was completely false, not just spun here and there to massage the truth to a particular political viewpoint.